So, again it is no secret, I love ducks. When my husband and I got up this morning, I asked him if he had any plans. Well he did.. I asked him… well do they have to be this morning. He looked at me with a look of familiar curiosity and asked what I had in mind. I said DUCK HUNTING!. The huh? look on his face was priceless. I handed him two cameras and said …let’s go! I have an idea for two more, maybe three more painting ideas..sharing the photos – just not the ones I am going to paint! 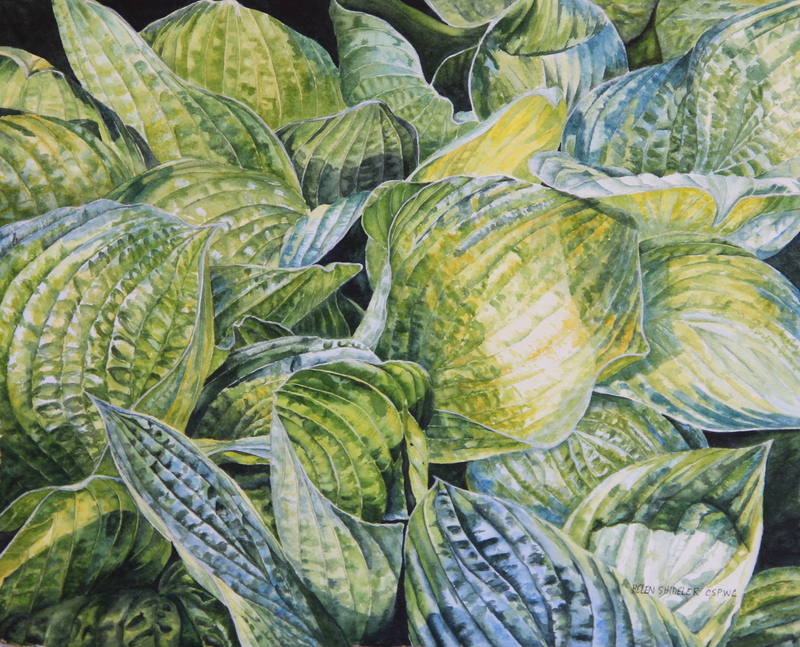 Working along on this painting – I have a few observations on working on Aquabord. Small areas work great – large washes – oh my – give me the heebeejeebees! 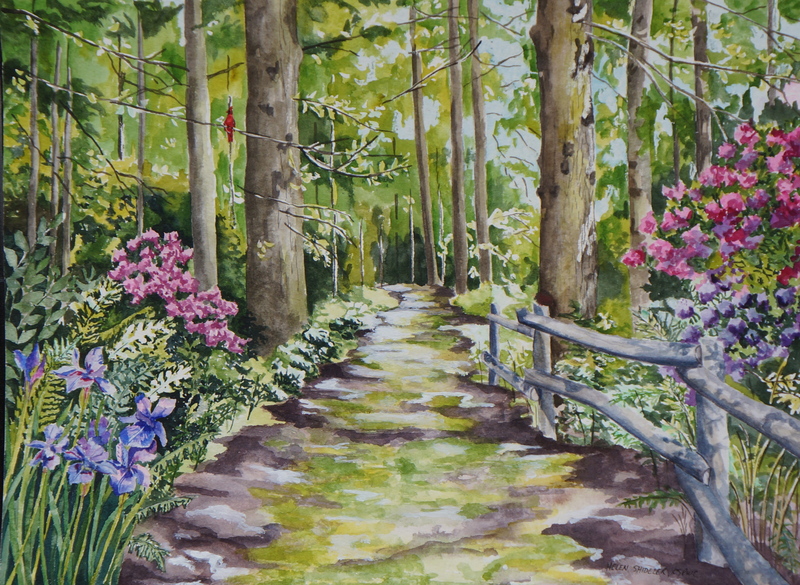 But I love the way the watercolor shines on this surface. 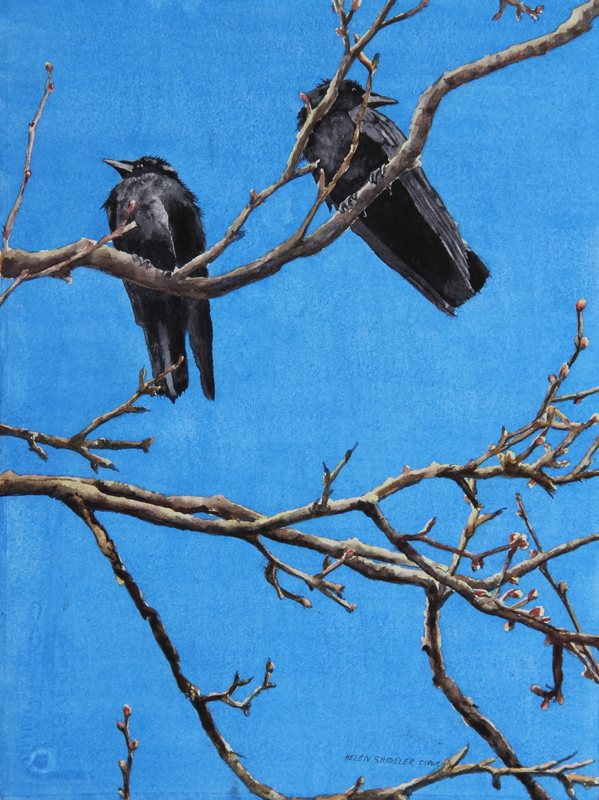 My next Aquabord project will be smaller – just saying! Each of the pots have about four layers of washes – will require a few more. The trick with this surface is that each wash has to dry completely – I am most happy when I am patient and give it 24 hours for larger areas! So, the problem is, I am really not that patient- I mean – wait for paint to dry? If you don’t already know and love these beauties, with flowers often larger than your hand, you may want to introduce formally yourself. A garden royalty they would appreciate an admiring nod. 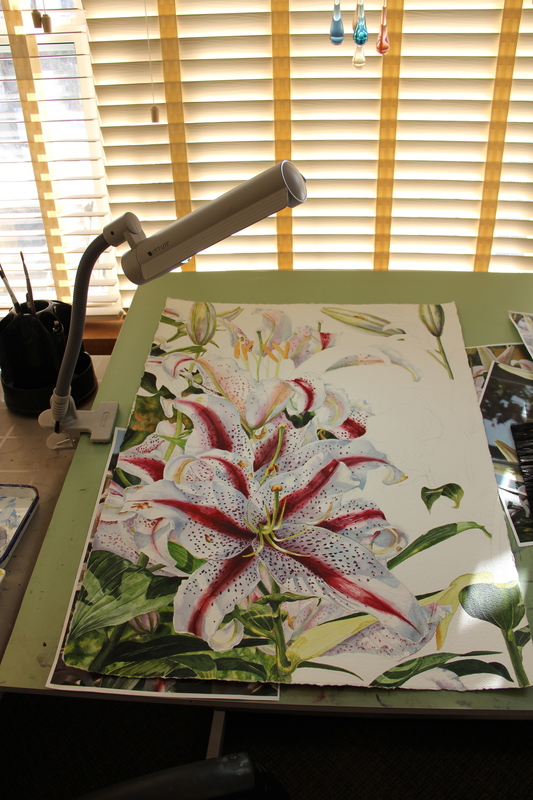 Lilies are among my absolute favourite blooms – likely stating the obvious as I paint them so often! 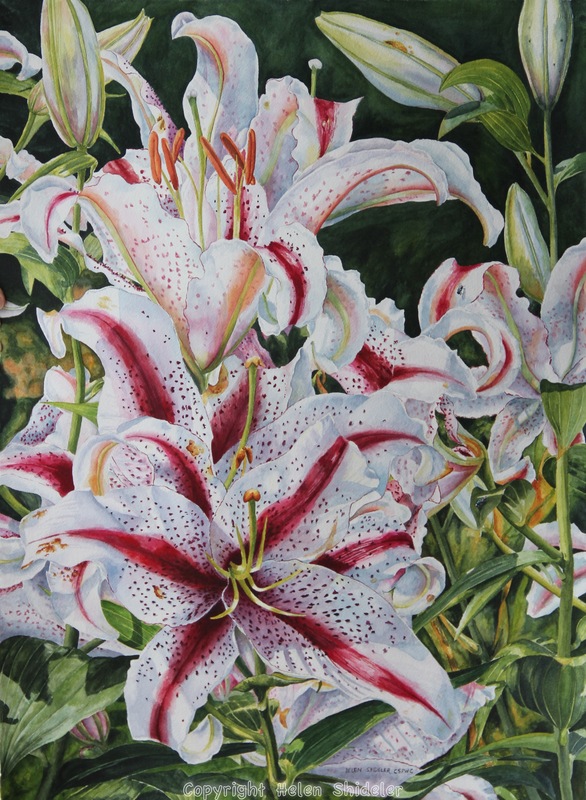 These lilies always live up to their royal statue by providing large and dramatic blooms each summer – if the deer do not get them. Wow, it sure has been awhile since I posted on this painting. Actually since July 8th! In fairness (to me) I did have a few commissions this past fall that took my time and attention. And I am pretty happy to have had the opportunity to do them. And then there were the ducks! I painting them just because I could and I loved working on them. Now back to work! 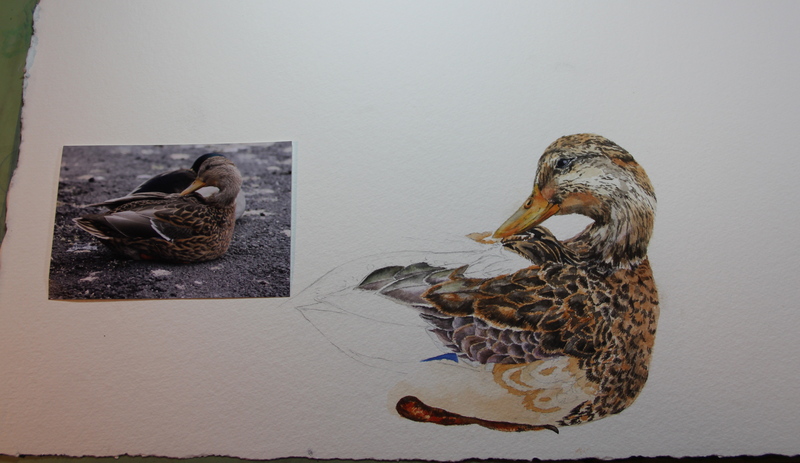 Awhile back, I started another watercolor painting that I was laying out and referring to as Ducks in a Row, working from various source photos. 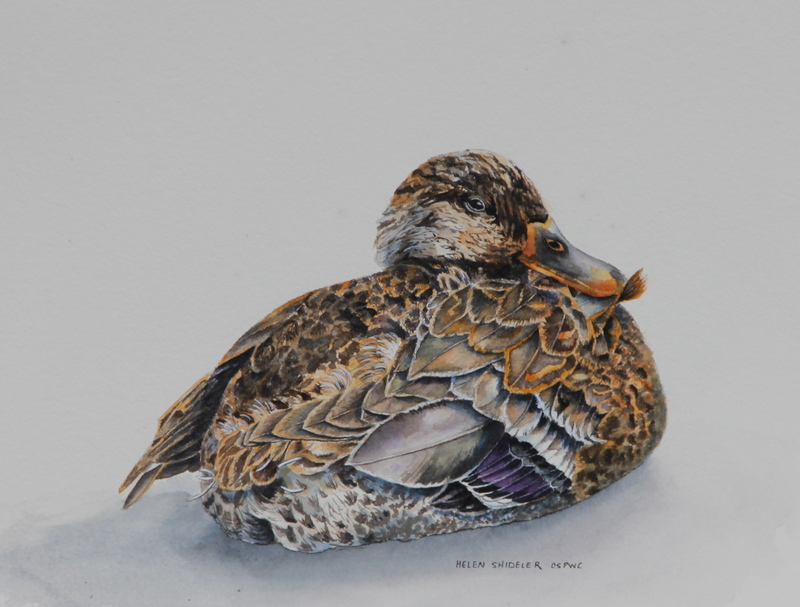 As I laid out the painting one duck at a time, I began to realize that some of my favorite photos of specific ducks would not fit well into the group composition. Such was the case of my Sitting Duck. If I layered her in, you would miss her backside and the neat perspective. So I decided she would have to be a stand, er sit alone painting. This particular painting took forever and was pure joy to work on and see it develop. Ducks make me happy. Their round cheeks and happy, almost smiling bill make me smile. To draw and paint them is absolute fun! On to the next one Dapper Dabbler and back to Ducks in a Row (which may be renamed soon)! This photo shows the painting darker than she really is. I had planned on painting this for quite a while. 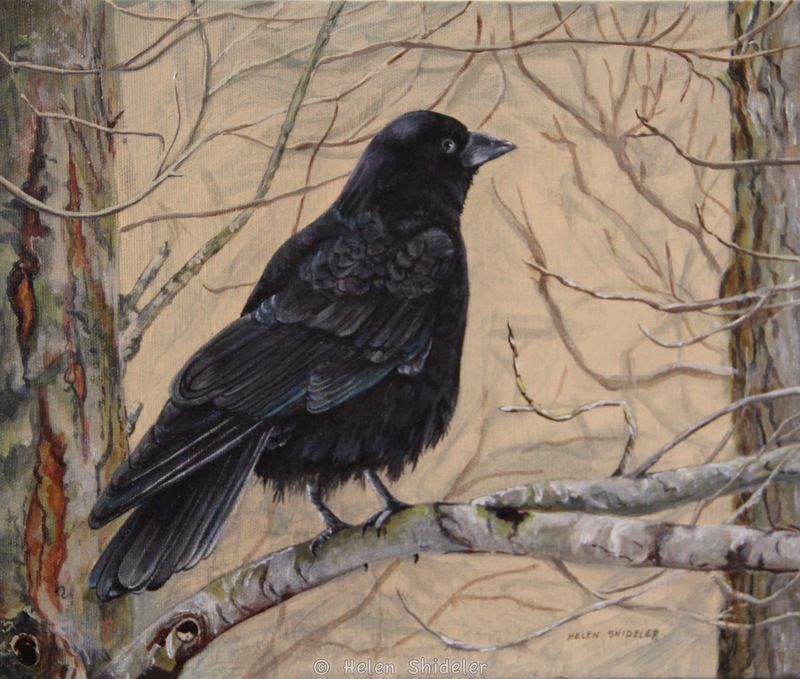 My hesitation came only from people’s reaction – you cannot paint only one crow. Huh? Everyone will think it is bad luck or something….. So, remembering back to a previous post “Didn’t See Nuthin'” .. I will post this as a work in progress in a few days. The Poem illustrated below is a nursery rhyme. Could not resist! Ten for a time of joyous bliss. There are so many things I love about getting new painting supplies. For example, I love the relationship I have with my brushes. When I am selecting a new brush, I “paint” my cheek with it before I make a purchasing decision. Then I showcase any new brush in a special container on my painting table. When I finally reach for it, it is almost a ceremony – definitely a ritual. Most recently, I’ve had a whole new brush experience! This year my daughters were shopping on-line for Christmas and had the gifts shipped to the house. Hmmmm. Not too shabby. And quite easy! Then one evening when I was catching up on reading blogs that I follow, one artist was talking about a special acrylic pallet she always uses in the field. Well, I never heard of this type of pallet before and so with help of my trusty fiend Google – I found it. On Amazon! And well, they had note at the bottom of the screen that said people who purchased this also purchased these….brushes. A perfect set of five Kolinsly sable watercolor brushes in a storage case and at an irresistible price. And they also had a set of teeny tiny detail brushes! Well how in the world could I not purchase both sets of brushes? And so I ordered them on-line. Without even the opportunity to rub them against the back of my hand or my cheek. What was I thinking? Oh yes, I was swayed by the incredible deal. And oh the money I’d save! Finally they showed up after Christmas (phew) and I am the proud owner of some lovely new brushes. The teeny tiny detail brushes came in just in time for me to play with the ducky paintings (already gave up on that idea). And the watercolor brushes, well will become part of my ever faithful collection. Did I mention I love them – thank goodness! Every few years I go on a duck painting marathon. They make me smile. With their round and full cheeks and happy bills, they are simply delightful to draw and paint. 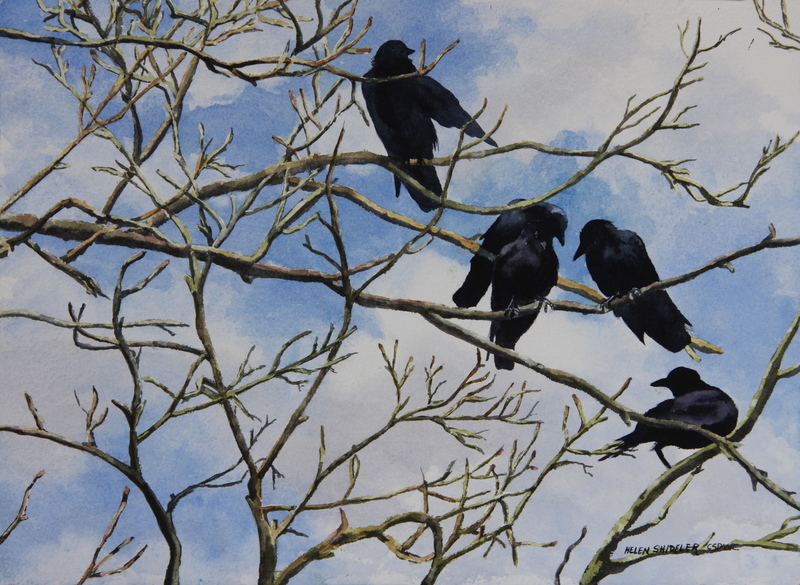 This time around, I am working in watercolour. Previous work was always in acrylics. 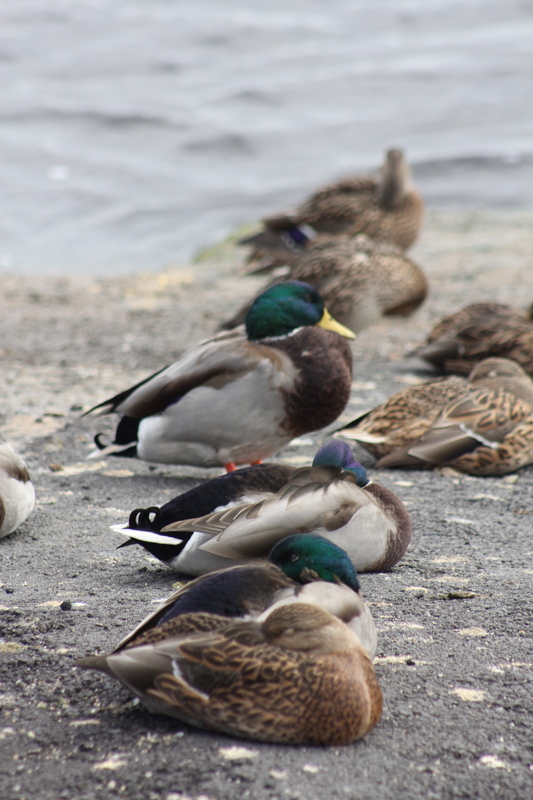 One day, when were out for a drive to see what I could shoot, we came upon a ferry landing that was covered with ducks. Apparently, somehow the ducks know they are safe from hunters at the ferry landing. But I got some great shots. Some were in the water while others basked in the sunshine, warming themselves on the asphalt and rocks. The inspiration photo has an interesting perspective -below. As I was shooting it I was thinking “he he heeee” ducks in a row. Well it stuck. The ducks in this painting will have come from individual duck photos I took and I will place them …well… in artistic order. Hoping to heaven I can capture the perspective I am aiming for. 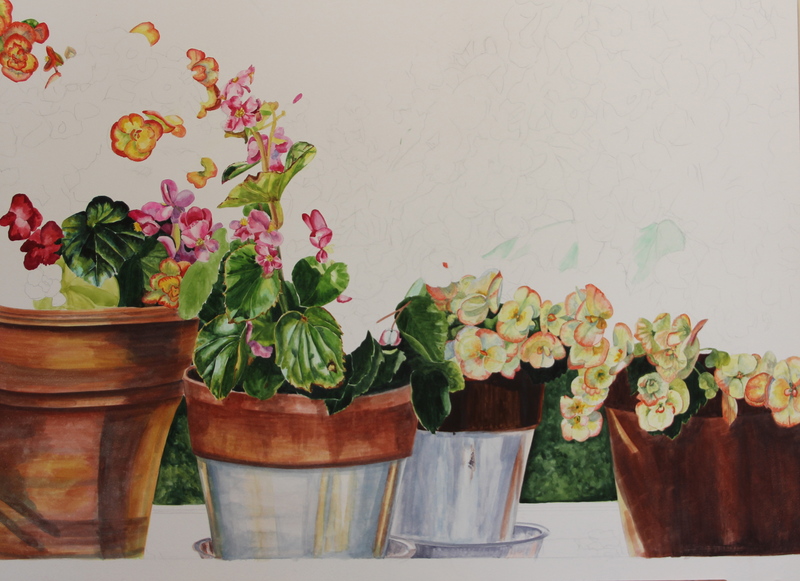 I have reached the nearly finished stage of this painting. I will stare at it and scrutinize it for a few days to see if I feel the need to go back in and color balance or make any adjustments at this time. 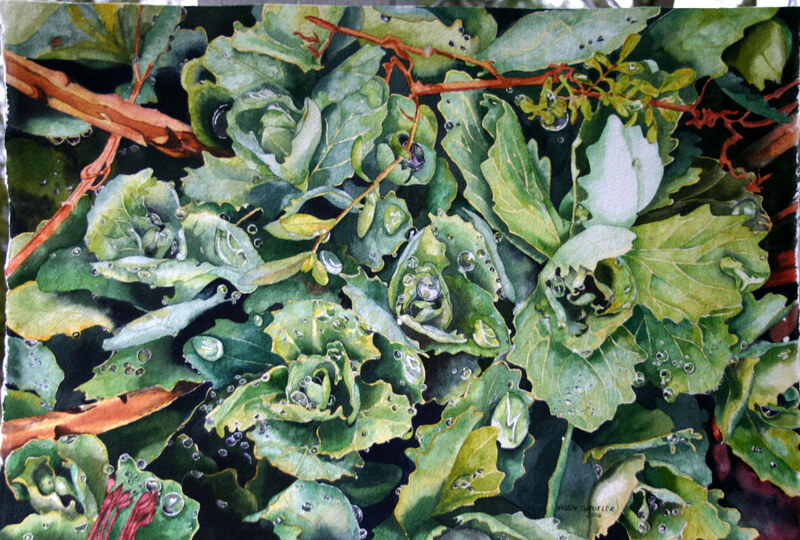 The amount of work on this painting reminds me a lot of a previous transparent watercolor piece “Raindrops on Sedum” (below) in terms of complexity. 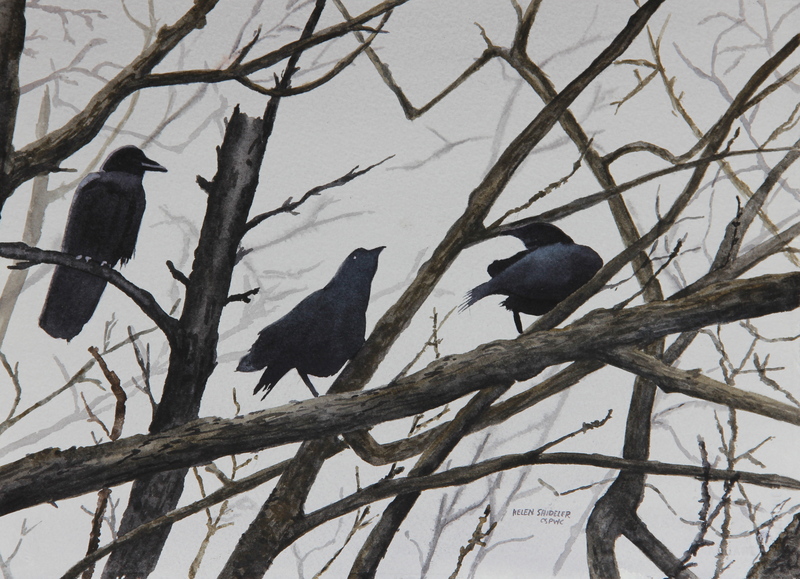 This painting won Best in Show at the CSPWC S’s For the Love of Art Associate Show in Halifax in 2006. Both of these paintings had a false start. I had them drawn out, started painting them and decided to abandon the first drawing and start over. Phew, thank goodness I do not get that urge too often!